Opal, the birthstone for October is one of the most attractive semi-precious stones known today. With various colors from red, gray, black to creamy white, the opal can also give off brilliant rainbows of color. It is these colors and the versatility of opal, which makes it one of the most sought after gemstones for jewelry. Opal has been used by humans for thousands of years, the earliest opal artifacts were found in Kenya and are dated to 4,000 B.C. The Greeks believed that this semi precious stone contained mystical powers. The popularity of opal grew as the Romans increased their influence and the stone was traded extensively throughout Roman colonies all over the world. Opals were also favored by British royals. Queen Victoria was reportedly very fond of opals and kept a collection of jewelry made of this semi-precious stone. 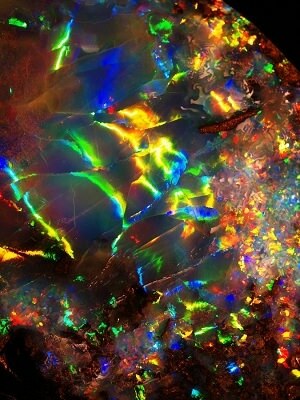 However, the opal was also associated with bad luck due to its curious colors. It was considered a bringer of bad luck in the 18th century. Spanish King Alfonso XII reportedly gave his wife an opal ring and she died a few days later. The various types of opal are solid, doublet, and triplet. The solid opal consists of the stone without any type of backing. The doublet has two layers of opal glued together. The triplet also has two layers of opal but they are separated by a layer of quartz. Black opal is the rarest and most valuable type of opal and named such because of its dark body, which can be black, blue, brown, or gray. Boulder opal is characterized by the thin veins of opal backed by layers of natural host rock and make for lovely and unusual pieces of jewelry. Light opal contains the greatest variety of colors. This type of opal is often referred to as water or jelly opal because of its translucent appearance. By far the most striking type of opal is the fire opal, created only within the volcanoes of Mexico. With its brilliant copper-orange coloring and lying within an attractive gold or silver setting, it is truly breathtaking. Because of the delicate configuration of opal jewelry, care is needed when cleaning opal rings and necklaces. One can clean opal jewelry by placing the stone in a dip made of water and dish-washing liquid. Wipe the stone using a soft washcloth or brush using a soft-bristle brush. Rinse afterwards before allowing the stone to dry on the towel. Cleaning opal jewelry should not be done on a daily basis, since constant exposure to water can weaken the glue. If you would rather wear a different gemstone, but would still like it to be a birthstone you can take a look at the traditional birthstones. Though better known as the birthstone for March, the aquamarine is the traditional birthstone for October, together with the opal. Aquamarines are beautiful gemstones with soft-blue to blue-green colors and are perfect for both rings and necklaces. While not cheap, you can still buy a great piece of natural aquamarine jewelry for less than $200. Prices can be lower still for heated aquamarine jewelry, this is a permanent change and does not damage the stone. The opal is an attractive stone that gives color and mystery to any jewelry. Opal rings and necklaces have been considered attractive yet inexpensive alternatives to more expensive stones. Their unique ability to play with light as well as their various layers of color also makes opals suitable for almost any occasion.